Although most commercial truck drivers are good at what they do, they are as likely to make mistakes as anyone else on the road. Commercial truck accidents are especially serious because they often result in fatalities. The real danger with commercial trucks is not their size or length, but actually their height. The large wheels on a commercial truck can pull smaller passenger vehicles underneath them, which inflicts severe damage on the car and passengers. Although the risk of getting into a commercial truck accident is easy to see, finding fault after one has occurred can be more difficult. The following will give you a closer look at determining fault in an accident involving a commercial truck. 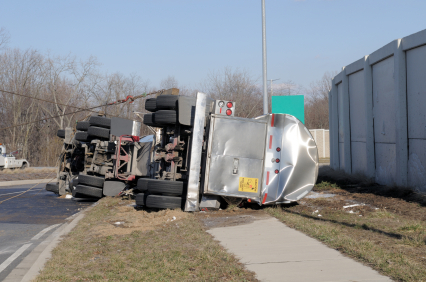 Unfortunately, determining liability in a commercial truck accident is far from simple. It is very rare that one driver is one hundred percent at fault for an accident. In many situations, both drivers are at fault, although one can be more at fault than the other. Insurance companies sort out the “less-at-fault” from the “more-at-fault” by determining negligence. Negligence is established when there is a duty to act reasonably, that duty is violated, and the violation results in injuries to the plaintiff. Negligence is established through eyewitness accounts and citations that are given at the scene of a commercial truck accident. In the ideal situation, the police respond to the accident quickly and interview the drivers, passengers, and any witnesses if possible. The police report alone is insufficient to prove negligence, but it can help determine which driver was more at fault. The police will also investigate and determine if any traffic laws were violated that led to the commercial truck accident. Violation of traffic laws could also be interpreted as negligence. In Texas, negligence or fault is determined using the modified comparative fault rule. This regulation means that in a commercial truck accident accident lawsuit, some fault may be assigned to all parties. The resulting awards may be decreased depending upon how much fault is assigned to the injured party. It is best to speak with a professional personal injury attorney that understands this law to know how your situation may be handled. Remember that three groups will contribute and decide who was at fault in a commercial truck accident: the police, the insurance investigators, and the witnesses. None of these entities can determine who is liable in a truck accident on their own, yet they each contribute evidence. Navigating the legal aspects of your accident can be difficult. Dean Boyd is prepared to assist you throughout a commercial truck accident investigation. Dean Boyd and his team are experienced at managing commercial truck accident lawsuits. Call us at (806) 242-3333 or Contact Us by email today. If you prefer a face-to-face consultation, visit our offices at 4423 SW 45th Ave in Amarillo, Texas or 5012 50th St #103 in Lubbock, Texas to speak with one of our personal injury attorneys.